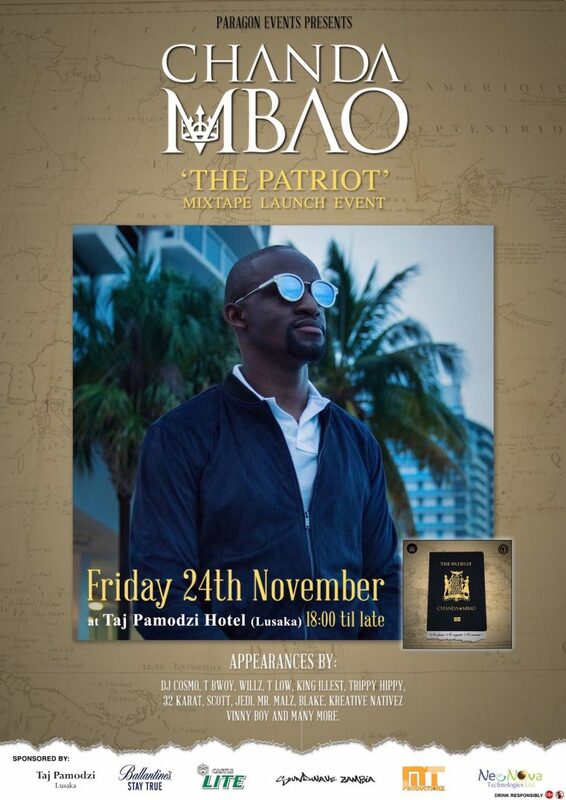 After a long wait, Chanda has made the official announcement that he will be launching the mixtape at the Lusaka five-star hotel backed by a live band on Friday 24th, November at 18:00hrs. Taj Pamodzi has come on board as lead sponsor alongside Ballantine’s, Castle Lite, Soundwave Zambia, MT Productionz and NeoNova Technologies. Tickets are available at The Wine Shop (Arcades or Kabulonga) or by calling 0955791402. General Admission is ZMW 100 and VIP is ZMW 250 which includes a three section buffet catered by Taj Pamodzi Hotel. Including features such as T Bwoy, DJ Cosmo, Willz, T Low and Scott, the mixtape is set to be an interesting collage of sounds centred within the Hip-Hop genre but fusing soundscapes from R&B, Dancehall and other genres, reflected in the varied collaborations. Almost all of the 15-track mixtapes collaborators are set to be in attendance of the event which will be covered heavily by multiple TV networks and media crews.